Pack size: 60 soft gels. Specifically formulated to help maintain normal vision in people aged over fifty, Ocuvite Complete Soft Gels are a once-a-day nutrient supplement for your eyes. Rich in all essential eye nutrients, these vitamin and mineral supplements improve the macula, which is vital for sharp and clear vision in your eyes. 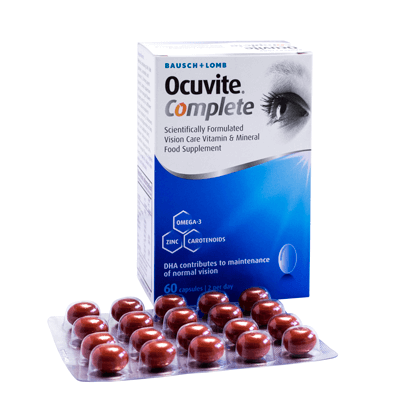 Brought to you by Bausch & Lomb, each soft gel of Ocuvite Complete is packed with Lutein, Zeaxanthin, Omega-3 fatty acids, Vitamins C & E and Zinc. The unique combination of these vital nutrients will prevent your vision from deterioration as you grow older. This Advanced Eye Nutrition formula has been developed by Bausch & Lomb based on an Age Related Eye Study. Since unhealthy lifestyle, poor eating habits and lack of exercises will drastically affect the health of your eyes as you age, regular intake of these nutrient supplements is recommended for maintaining good vision. While the anti-oxidant Lutein in these soft gels will protect the macula of your eyes from harmful blue light and free radicals, Zeaxanthin ensures your vision is clear and sharp. Omega-3 fatty acids are essential for proper functioning of your retina and supporting the overall eye health. So in order to overcome dietary deficiencies and proactively replenish the key ocular nutrients, you can take these Ocuvite Complete Soft Gels that are available in convenient tablet form. Each pack contains 60 soft gels, to be taken with your meals.